FusionCash is an easy GPT thanks to some of its features not usually found on other Get Paid To sites. If you’re tired of struggling with offers and surveys, you can earn from its PTC feature, emails, forum and by providing proof that you’ve been paid by them. Earning from referrals is also a great way since FC has a great referral system. Aside from the unique ways to earn from FusionCash, we also earn from the typical GPT ways. From filling out offers, answering surveys, watching videos, completing tasks, searching online, signing up to other companies, and downloading apps. The PTC section is a quick 2 and a half minute process for an extra 15 cents. It’s not much but it can be done daily and effortless. The problem is that we must first earn at least 5 cents from doing other things. It used to be easy with HyprMX around, but that is no longer the case. So the easiest method now is by completing offers from the videos section (they’re long slideshows instead of videos). Earn by receiving a daily email worth 2 cents by clicking its link. Almost that simple as it then requires an annoying captcha interaction (from Solve Media and not Google’s, thankfully). But the email will only come from FusionCash itself, so no worries about getting spammed. However, if you’re not comfortable about this, don’t worry as you have to opt-in to allow these emails. Email sent by FusionCash to my Gmail account. Notice how it comes from FC itself and not a 3rd party. After clicking the email link, it takes us to the FusionCash website where the 3rd party offer is provided. We must click on and solve a simple captcha to earn the 2 cents. Members can earn by contributing in their forum. There needs to be 30 quality posts that are meaningful and absolutely not spammy. We get a $3 bonus a month if we contribute said posts. Personally, I would only recommend this to people that are great at socializing and providing meaningful comments with ease. 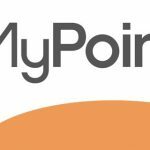 We get a $1 bonus every time we submit payment proof for them to post it on their forum for the skeptic to look at. This is very simple. We only have to paint over our personal information before submitting. I would forget to do it a lot until I completely stopped doing it in mid 2014. 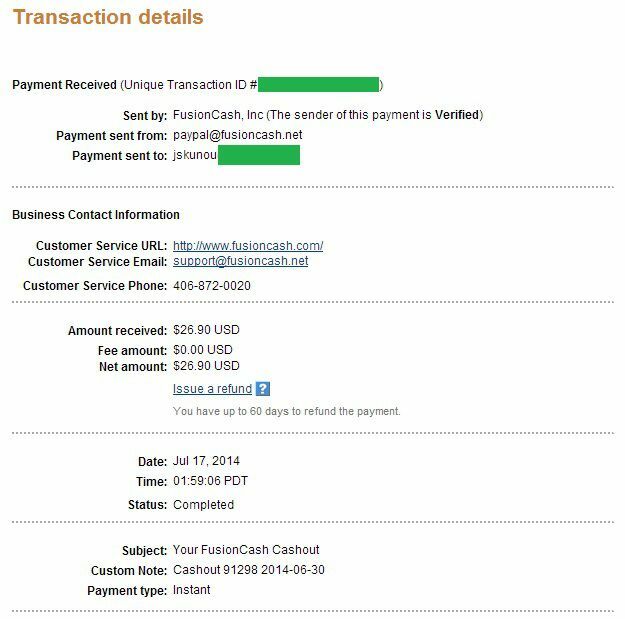 As proof that I used to do it, here is my last submitted payment proof to them (notice how the link comes from their web address): FusionCash payment proof of July 2014. There’s a $5 bonus for signing up. There’s a $1 bonus from referring new members, another $2 when they finish their first survey or offer, and another $5 when they cash out. The $5 bonus from cashout is continuous for life from each and every referral. Most GPTs pay with gift cards, but FusionCash also pays through PayPal and direct deposit as well. There are no cashout fees regardless of payment method! Unfortunately, not all earning sites go by some mortal ethics. This is something I despise in some of these GPTs. The money you earn should be money that you should get paid eventually. Imagine if your money expired in your bank account. How crazy would that be? Each offer/task completed has its own expiration date of 180 days. Once those days go by and you haven’t cashed out, then you’re out of luck. It doesn’t matter how much you’ve earned. This is a harsh way to make us active. So if you believe you can’t be active between cash outs, then I can’t recommend FusionCash to you. I don’t think we get banned for being inactive, though. Once you cash out, you can take a very long break and then come back, be active until you cash out, and then take a break again. That can work out to avoid expiring earnings. Each task or offer has its own date completion and recorded so we can keep up with their expiration date. After 180 days, they get marked as expired. FusionCash tries to make it easy for us members to earn compared to other GPTs. The bonuses are a good incentive for us to keep going for that extra cash. FC has been in business for more than 10 years now. I’ve been paid every time with zero problems. Their referral system is very generous, too. Credits from all earning types expire after 180 days! This is a terrible way to keep members active. Once you make an account, try to reach the minimum of $25 to cash out before the half year goes by. Or else you’ll lose the bonuses and each of the offer earnings that you’ve rightfully earned. However, at least they do keep a status page of all the dates from each and every credited offer. It is advisable to keep track of dates once in a while. 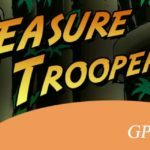 As all GPT sites work, some offers refuse to credit. This is not the GPT site’s fault but the sponsors that run the offers. At least FusionCash’s own tasks always credit as long as we follow instructions correctly. The minimum to cash out is $25, but that does not include bonuses and referral earnings. At least $15 must come from our own efforts in order to cash out $25 or more with bonuses and referral earnings, though. For example, $25 from our own efforts or $15 from our own efforts with $10 from bonuses and referral earnings. Although FusionCash’s referral program is not as good as CashCrate‘s and TreasureTrooper‘s, it still has a great referral system that far surpasses InboxDollars (a GPT I would never recommend). 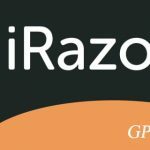 Next story iRazoo Review: Is It Worth It? Previous story ClixSense Review: One of the Best GPTs…!